The first grade students of Knollwood School are proud to present their Spring Program, "I Can Learn". It will be held in the Nest (cafeteria) at Brookside High School on Tuesday, April 23, 2019. Performance is at 7:00 PM. Students need to arrive by 6:45 PM. Please make sure your child knows how they will travel home before they arrive at school in the morning. We cannot guarantee requests at the end of the day will reach your student in time for dismissal. It is our goal to get every student home safely at the end of the school day in a timely manner. Please call the office before 2:30pm with any changes needed. If you should have any questions, please feel free to contact the office at 949-4234. 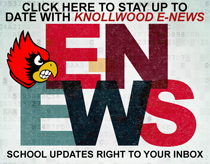 There is a new procedure for parents visiting during the school day that will be implemented at Knollwood and Forestlawn this year. When a parent wants to visit their child's classroom during the day, the parent will have to either call or email the teacher to set up an appointment. Frequent distractions interrupt the educational process of learning for all of the students and is often hard to get all the students back on the learning track. Thank you for helping us keep the learning environment a productive one. The Lorain County Imagination Library is making free books available to children up to 5 years of age. The communities of Sheffield Village and Sheffield Lake are eligible for their young readers to receive a book a month through this early literacy program. For more information please visit the Community Foundation website at http://www.loraincountyimaginationlibrary.org/ and click on the Register Link to get started. Welcome Back! I am looking forward to an outstanding year. Please keep in mind as the school year begins, there will be procedures to the entry and dismissal at Knollwood. Breakfast begins at 8:20. The entry bell for all students is at 8:20. If your child is a car rider, please drop your child off at the back doors to enter into school.